Oil Profits & War: Coincidence? Or Causation? This is for all the chart junkies out there, especially the conspiracy theorists (remember, just because you’re paranoid, doesn’t mean they’re not out to get you!). I’d love to see a similar chart comparing the relative stock market return of oil companies to a wide proxy like the S&P 500 Index (SPX). 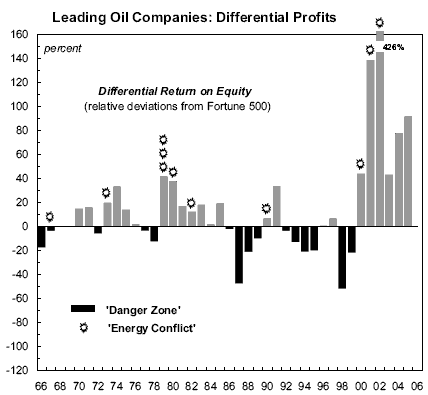 The difference between the return on equity of the oil companies and of the Fortune 500 is expressed as a percent return on equity of the Fortune 500. Note: The leading oil companies include British Petroleum (BP-Amoco since 1998), Chevron, Exxon (ExxonMobil since 1999), Mobil (until 1998), Royal-Dutch/Shell and Texaco (until 2000). Company changes are due to merger. Until 1993, the Fortune 500 included only industrial corporations (firms deriving at least half their sales revenues from manufacturing or mining). From 1994 onward, the list includes all corporations. For 1992-3, data for Fortune 500 companies are reported without SFAS 106 special charges. Source: data from Fortune and Compustat. Chart from Bichler & Nitzan Archives.